We watched Sleeping Beauty over the weekend, and it got us in the mood to whip out our Disney costumes! You may have done Disney before, but chances are you haven’t done it with us. Our Disney costumes are guaranteed to transform your little one into the dazzling star of his or her own fairy tale adventure! Little ladies will shine in princess costumes while brooding young men will tackle the world as superheroes and villains. Your little girl has always adored Belle. She’s practiced her song and dance routine with her very own Mrs. Pot and Chip, and even plays pretend with her teddy bear as a stand in for the Beast. 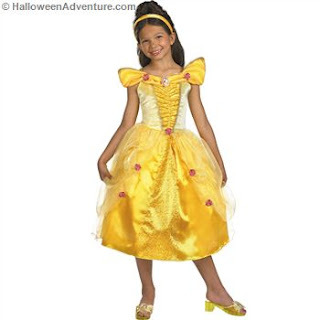 Surprise her this Halloween with our Belle costume, a sparkling yellow confection sure to turn heads in the neighborhood. With just enough Tulle and a whole lot of sunshine, this costume will have her saying “Bonjour” and “Merci” in no time. Maybe she’s more of a Cinderella type. She’s watched the video so many times your VHS copy is scratched, and she’s acted out every scene there is. Last year she was Cinderella in rags. Take it to the next level this year and give her the best Cinderella dress a girl could ask for. Our Cinderella costume,with a poufy blue skirt and lots of sparkles, is perfect for your little princess. Fairy godmother not included. Watch out for the witch! Snow White’s in town, and you’ve got to protect her from that poison apple! Thankfully, Halloween in your neighborhood means candy and chocolates, but no poison apples to be found. Deck your lady out in the quintessential Snow White Costume to match her childhood movie heroine. Add some rouge to her cheeks and let her use your red lipstick, and you’ve got yourself the fairest maiden in the land. Don’t think we’ve forgotten about the men in your household! From superheroes to super villains, we’ve got them covered. Disney’s The Incredibles may be “old news” to your child now, but when he sees our Mr. Incredible Costume, he’s sure to change his mind! This snappy red suit transforms even the most ordinary mortals into super powered men able to carry the world in their hands. Got a boy who’s still obsessed with Toy Story? 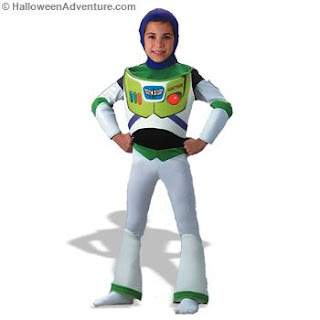 Let him tell his own story with our Buzz Lightyear costume. Step into this getup and you’re transported to a world where stuffed animals speak, Barbie dolls are feisty, and GI Joe’s one to look out for. Enter Buzz, the hero who will save them all! (Even if “all” just means the rest of the neighborhood). These choices and more are available on our website at halloweenadventures.com. Stop by today to check out the wide range of Disney costumes and let your fairy tale adventure begin!